A mealtime makeover that's toddler (and parent) approved! Sometimes all it takes is fun tableware to make a meal interesting for kids. Set the table in toddler-friendly style with this sweet dining set featuring our Splash™ collection! Designed especially for little mouths and hands, the set brings self-feeding up several notches with comfy, easy-grip handles on the fork, spoon and kid-safe knife; grippy bottoms and deep walls on the plates and bowl, and an array of fun, peppy colors to choose from. BPA-free and dishwasher safe, these are a definite dining do! Toddlers love eating like grown-ups, and because they come in a variety of colors, these sets are perfect for color-coding in households with multiple kids. The whimsical box doubles as a surface for coloring, too. 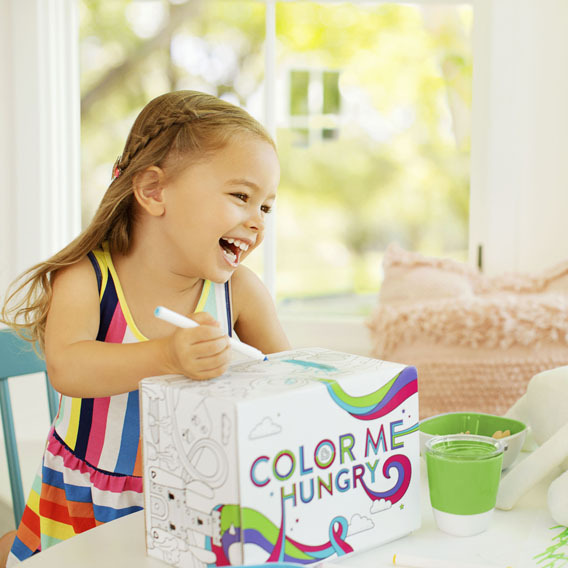 Color us hungry -- and happy!